As a kid, my dad would go on a lot of business trips out of the country. I would always look forward to his trips not because he would be gone, but because when he came back it usually meant new toys for me. After one particular trip to Japan, he brought home a bunch of little robots I had never seen before. While i’d had my fair share of robots up to that point, these ones were quite different as they each transformed into some kind of vehicle, one turned into a helicopter, another a van and still another, a spaceship. Another peculiar thing about them was their names, they each had a unique number designation, but they all went by the name “mister”. Machine Robo (which is what MR actually stood for...not mister) was a Japanese toyline produced by Bandai way back in 1982. As their name states, this was a line of robots that turned into different types of machines. Sound familiar? Well, even back then, robots turning into machines wasn’t THAT unique of a concept. Another Japanese toy company called Takara had a similar line called Diaclone around the same time. Anyway It was also around this time that robots started getting popular in the US so toy companies there started looking to Japan for new robot toys to bring over. One company called Hasbro partnered with Takara to bring their Diaclone line to America repackaged as the Transformers. 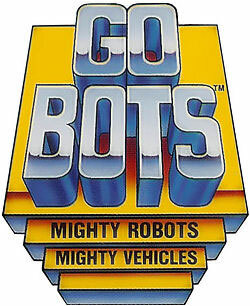 While another one, Tonka obtained the license to market Bandai’s Machine Robo line and rebranded that into the Gobots. Nowadays, almost everyone and their grandmother knows what a Transformer is. Unfortunately a significantly less number remember what a Gobot was. In fact, for many who do remember them, the Gobots are recalled as nothing but Transformer knock-offs. The irony here is that actually Tonka beat Hasbro to the punch, releasing their Gobot toy line a full year before the first Transformer came out in stores. But even a significant headstart on the retail shelves was not enough to beat out those “Robots in Disguise”. 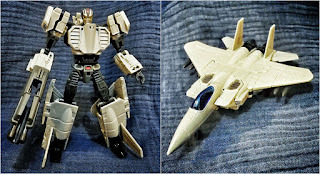 While the Transformers have since become a household name to many, the Gobots unfortunately have become nothing but a footnote in the history of US toylines. So what happened? While it would be easy to just say that Transformer toys were just better, I would tend disagree. Sure Transformers had more variety, but Tonka was pretty consistent with their Gobots line producing simpler, smaller but quality toy robots. More importantly their size usually meant cheaper toys that were easier for kids to collect. 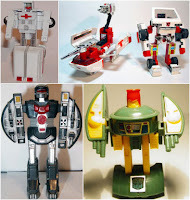 While I didn’t have many Gobots per se, I did have a lot of Machine Robos, which were basically the same thing, and I loved them! 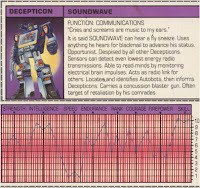 I didn’t have much Transformers precisely because they more expensive. If you compared apples to apples and placed your average Gobot next to one of the smaller Transformers selling at a similar price point...more often than not, the Gobot would actually be the better toy in terms of looks and quality. If you ask me, what ultimately did the whole Gobots line in was the fiction that accompanied the toyline. When it came to “building” the entire Transformers universe, Hasbro didn’t cut a single corner. 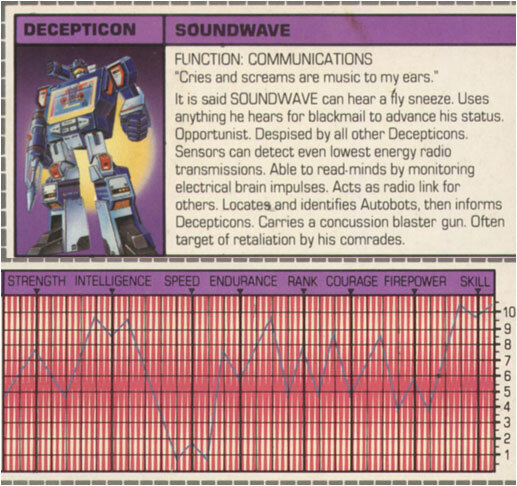 Every Transformer had a fairly detailed bio describing the personality and motivations of either the heroic Autobot or evil Decepticon. Each character came with a “tech spec” graph that showed how each character ranked in terms of categories such as strength, courage, speed, firepower etc. In short, we got to “know” who all these Transformer characters were. On the flipside, all Tonka gave us with their Gobots packaging was whether the robot was either a friendly “Guardian” or an enemy “Renegade”and a generic blurb about the Gobots toyline. And while Hasbro gave us such memorable names like Optimus Prime, Starscream & Jazz….Tonka seemed to phone it in with uninspired names such as Leader-1, Cop-Tur & Scooter (admittedly...Cy-Kill was a cool name) more often than not alluding to what the robot converted into. 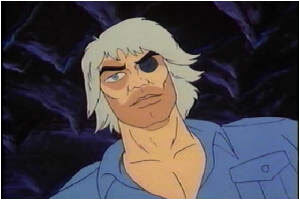 Both toylines also had cartoons produced and even those were like night and day. While many people will readily admit that the original Transformers cartoon doesn’t hold up today...I’m pretty sure you will have an even harder time finding anyone admitting that the Gobots cartoon was any better. Many critics tend to dismiss both cartoons as blatant extended commercials for their respective toylines...and they’re partly correct. So if viewed as such, you could say, compared to the Transformers, the Gobots cartoon did a lousy job at pushing their product. 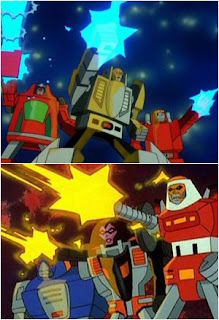 While every episode of the Transformers featured numerous characters from the toyline on a regular basis, the Gobots featured the same three Guardians and Renegades in every episode. To mix things up they would just feature an “extra” Gobot or two beamed in from their home planet of Gobotron every episode as a special guest, but that was it. Anyway, despite having the inferior cartoon, I would have to admit that the Gobots actually had a pretty interesting origin story as compared to Transformers. Unlike the Transformers, who were a race sentient robots from the start, the Gobots were actually originally organic beings...similar to humans called Gobeings (yeah...Gofigure). A catastrophic event directly caused by their never ending civil war forced them to collectively transfer their minds into mechanical bodies in order to survive turning them all into Gobots. Since they were originally organic beings, it is also worth mentioning that that from the start, the Gobots had a good mix if male and female characters. And most of the females visually didn’t look very different from the males...only their more feminine voices gave them away. And they weren’t damsels in distress or background characters either but fellow warriors with major roles. Females in the original Transformers cartoon were pretty much non-existent. I remember they were featured in an episode or two as “guest stars” but that was it. And there was no mistaking their femininity with cliche curvier bodies colored in lighter pastel colors. The first significant Transformer female character, Arcee was finally introduced in the 1986 movie...and even she was pink with a head design sporting what looked like Princess Leia buns. This I believe was one of the rare positives you could draw from the Gobots cartoon over the Transformers….in a sense when it came to the sexes, they were more...progressive. 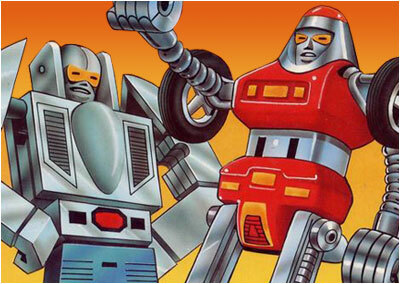 Now while a lot of people would assume that the Gobots toyline ended due to being beaten out by the Transformers, probably the more real reason for their demise was the fading popularity in Japan of the Machine Robo line. So in 1985, the Gobots cartoon was cancelled and in 1987, the toyline followed. 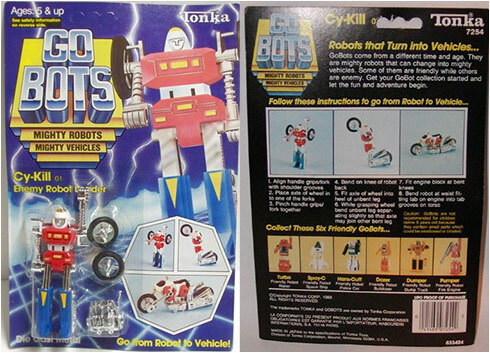 Eventually Tonka itself was bought by Hasbro transferring ownership of the Gobots concept and characters to them. It’s worth noting though that Bandai only leased the rights to produce their Machine Robo toys to Tonka so those toy designs weren’t included in the Tonka purchase. Which is most likely the reason why Hasbro never bothered making any new toys based on the original Gobots series. Every now and then however they would throw out a bone to Gobots fans (all 3 of them) by doing a homage to some Gobot character, by either reusing a Gobot name or repainting an existing Transformer toy with the palette of a more recognizable Gobot. Or they would make cameo appearances in the comics either as background characters or as unnamed robot fodder for other Transformers to kill. It’s not all bad though for the Gobots. Every now and then a third party company will do “masterpiece” style Gobot, which more often than not is still a repaint of one of their existing releases but they are a considerable step up from the typical Hasbro release. I bit on one done by third party company DX9 called Cocomone which was a repaint of their MP style Mirage done as a homage to the evil Renegade Crasher, who was one of the more memorable Gobot characters. To be honest, it’s a little underwhelming, definitely not a masterpiece but looks OK on the shelf. A couple years ago, another company, Action Toys started an officially licensed Machine Robo line, while not exactly Gobots per se, at this point they are the closest thing we will get to an actual modernized “masterpiece” Gobot toy. To date they haven’t released much...and to be honest I’m not really sure how well these guys are selling but I did manage to get a couple of their releases. 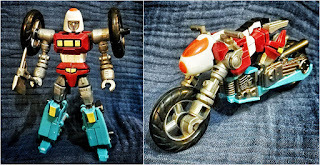 I got the Bike Robo and Eagle Robo which in the Gobots series became the leaders of the 2 battling factions, Cy-Kill, who led the evil Renegades, and Leader-1, leader of the friendly Guardians. Again since these are actually Machine Robo toys and not Gobots, their faces look nothing like the cartoons...but again...it’s close enough! The toys themselves look very good! They’re a bit fiddly, especially Leader….I mean Eagle Robo, but I can live with that. What bothered me more was the fact that they differed considerably in size with Eagle Robo being a lot taller. While I get it...a jet should be bigger than a motorcycle, it was still irritating, until I came upon this Gobot animation size chart….Now I’m not sure exactly how accurate or official this is but it clearly shows Leader-1 towering over Cy-Kill….so I guess those Action Toys designers were onto something. Anyway, to end, you know the saying that History is written by the victors? Well in this case, most of it is written by Transformers fans, most of whom do write the poor Gobots off as 2nd rate wannabe Transformers. 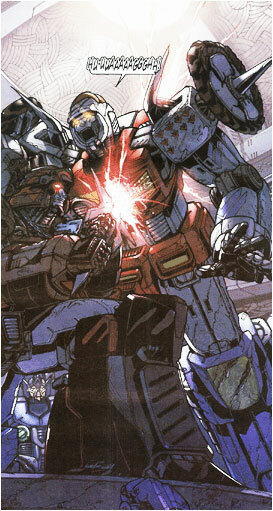 Well, they weren’t perfect, but as a Transformers fan myself, even I will admit that they were pretty cool. 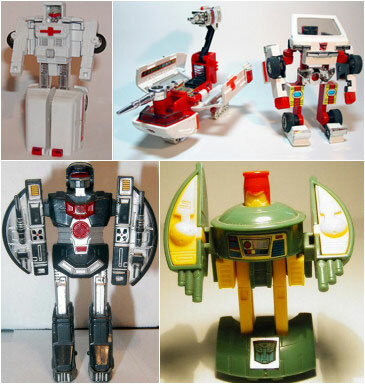 Growing up I never saw Gobots toys as inferior, they were just more robots that I could collect and play with. And even if the cartoon wasn’t very good...I still watched it. I’ll always have a fond recollection for these “Mighty Robots, Mighty Vehicles”....and keep a small portion of my shelf reserved for them.